I received my Ph.D. (2005) and M.A. (2001) in Sociology from the University of Massachusetts Amherst. Previously, I earned a B.A. in Sociology from the State Academy of Management in Moscow, Russia. I am an Associate Professor in the Sociology Department of Boston College since 2005. I am also affiliated with the Sloan Center on Aging and Work/Workplace Flexibility. My research interests include race, gender, and class, family sociology, aging and the life course, and quantitative methods. Sarkisian, Natalia, and Naomi Gerstel. 2012. 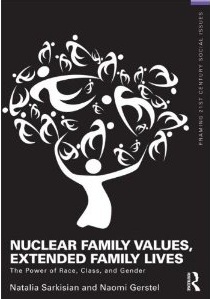 Nuclear Family Values, Extended Family Lives: The Importance of Gender, Race, and Class. New York: Routledge. When discussing families, politicians and sociologists alike typically focus on parents and their young children. They are especially likely to emphasize issues related to marriage, highlight the role of fathers, and promote the importance of a two-parent nuclear family. This book argues that such rhetoric is a poor reflection of the everyday lives of many Americans for whom family includes aging parents, grown up children, adult siblings, aunts, uncles, cousins, grandparents, and grandchildren. This book questions the focus on nuclear family by highlighting the roles that these extended family members play in the lives of Americans. It demonstrates that many Americans spend substantial amounts of time with their relatives, frequently rely on extended family members for help, and provide assistance in return. The book argues that this narrow emphasis on marriage and the nuclear family, with its exclusion of the extended family, is particularly likely to overlook family experiences of women, racial/ethnic minorities, and low-wage workers and the poor for whom extended families are centrally important. This book also addresses another facet of the popular rhetoric on families--that emphasizing the role of marriage as social glue. For many social critics and observers, not only is the nuclear family the basic unit of society, but marriage is the foundation of the community. Marriage, to them, is the endangered basis of a healthy society, whose fragility threatens children and adults as well as the broader community. In contrast, this book demonstrates that in many ways, marriage actually separates men and women from other social connections and therefore detracts from ties to extended families and broader communities. These isolating effects of marriage are felt across race and class, but because those with fewer economic resources are more likely to rely on extended family, these effects of marriage are particularly costly to them. The book concludes with an examination of the impact of nuclear family rhetoric on social policy. In line with this rhetoric, many social policies, including family and medical leave policies, Medicaid, gay and lesbian marriage, welfare reform, and policies on grandparents, are geared towards the nuclear family. We argue that this inattention to the extended family reduces the effectiveness, reach, and potential power of family policy. The book concludes that not only does a focus on marriage and the nuclear family miss a great deal of family life and denigrate poor and minority families, but it also facilitates social policies that discriminate against women, people of color, and the poor and thereby reduces the power of social policy to improve lives of Americans. McNamara, Tay, Marcie Pitt-Catsouphes, Natalia Sarkisian, Elyssa Besen, and Miwako Kidahashi. Forthcoming. "Age Bias in the Workplace: Cultural Stereotypes and In-Group Favoritism." The International Journal of Aging and Human Development. Sarkisian, Natalia, and Naomi Gerstel. 2016. "Does Singlehood Isolate or Integrate? Examining the Link between Marital Status and Ties to Kin, Friends, and Neighbors." Journal of Social and Personal Relationships, 33, 3, 361-384. Sweet, Stephen, Natalia Sarkisian, Christina Matz-Costa, and Marcie Pitt-Catsouphes. 2015. "Are Women Less Career Centric Than Men? Structure, Culture, and Identity Investments." Community, Work, and Family, 19, 4. Karamnov, Sergey, Natalia Sarkisian, Rebecca Grammer, Wendy L. Gross, and Richard D. Urman. 2015. "Analysis of Adverse Events Associated with Adult Moderate Procedural Sedation Outside the Operating Room." Journal of Patient Safety. Calvo, Rocio, and Natalia Sarkisian. 2015. "Racial/Ethnic Differences in Postmigration Education among Adult Immigrants in the USA." Ethnic and Racial Studies, 38, 7, 1029-1049. Calvo, Esteban, Christine A. Mair, and Natalia Sarkisian. 2015. "Individual Troubles, Shared Troubles: The Multiplicative Effect of Individual and Country-level Unemployment on Life Satisfaction in 95 Nations (1981-2009)." Social Forces, 93, 4 (June), 1625-1653. Johnson, Jessica, Natalia Sarkisian, and John Williamson. 2015. "Using a Micro-Level Model to Generate a Macro-Level Model of Productive Successful Aging." The Gerontologist, 55, 1 (February), 107-119. Calvo, Esteban, Natalia Sarkisian, and Christopher R. Tamborini. 2013. "Causal Effects of Retirement Timing on Subjective Well-being: The Role of Cultural Norms and Institutional Policies." Journal of Gerontology: Social Sciences, 68, 1 (January), 73-84. Garroutte, Eva Marie, Natalia Sarkisian, and Sergey Karamnov. 2012. "Affective Interactions in Medical Visits: Ethnic Differences among American Indian Older Adults." Journal of Aging and Health, 24, 7 (October), 1223-1251. Oh, Seil, and Natalia Sarkisian. 2012. "Spiritual Individualism or Engaged Spirituality? Social Implications of Holistic Spirituality among Mind-Body-Spirit Practitioners." Sociology of Religion, 73, 3 (Autumn), 299-322. Collins, Amy L., Natalia Sarkisian, and Ellen Winner. 2009. "Flow and Happiness in Later Life: An Investigation into the Role of Daily and Weekly Flow Experiences." Journal of Happiness Studies, 10, 6 (December), 703-709. Garroutte, Eva, Natalia Sarkisian, Dedra Buchwald, Jack Goldberg, and Jan Beals. 2008. "Perceptions of Medical Interaction between Healthcare Providers and American Indian Older Adults." Social Science and Medicine, 67, 4 (August), 546-556. Shen, Ce, Natalia Sarkisian, and Thanh Tran. 2008. "Child Mortality, Economic Development, and Social Inequality in Less Developed Countries: A Cross-National Analysis." China Journal of Social Work, 1, 2 (July), 172-188. Sarkisian, Natalia, and Naomi Gerstel. 2008. "Till Marriage Do Us Part: Adult Children's Relationships with Parents." Journal of Marriage and Family, 70, 2 (May), 360-376. Sarkisian, Natalia. 2007. "Street Men, Family Men: Race and Men's Extended Family Involvement." Social Forces, 86, 2 (December), 763-794. Sarkisian, Natalia, Mariana Gerena, and Naomi Gerstel. 2007. "Extended Family Integration among Euro and Mexican Americans: Ethnicity, Gender, and Class." Journal of Marriage and Family, 69, 1 (February), 40-54. Sarkisian, Natalia. 2006. "'Doing Family Ambivalence': Nuclear and Extended Families in Single Mothers' Lives." Journal of Marriage and Family, 68, 4 (November), 804-811. Gerstel, Naomi, and Natalia Sarkisian. 2006. "Marriage: The Good, the Bad, and the Greedy." Contexts, 5, 4 (November), 16-21. Sarkisian, Natalia, Mariana Gerena, and Naomi Gerstel. 2006. "Extended Family Ties among Mexicans, Puerto Ricans, and Whites: Superintegration or Disintegration?" Family Relations, 55, 3 (July), 331-344. Garroutte, Eva, Natalia Sarkisian, Lester Arguellos, Jack Goldberg, and Dedra Buchwald. 2006. "Cultural Identity and Perceptions of Health Status among American Indian Older Adults and Their Healthcare Providers." Journal of General Internal Medicine, 21, 2 (February), 111-116. Sarkisian, Natalia, and Naomi Gerstel. 2004. "Kin Support Among Blacks and Whites: Race and Family Organization." American Sociological Review, 69, 4 (December), 812-837. Sarkisian, Natalia, and Naomi Gerstel. 2004. "Explaining the Gender Gap in Help to Parents: The Importance of Employment." Journal of Marriage and Family, 66, 2 (May), 431-451. Ollier-Malaterre, Ariane, Natalia Sarkisian, Sarah Stawiski and Kelly M. Hannum. 2013. "Work-Life Balance and Performance across Countries: Cultural and Institutional Approaches." Pp. 357-380 in Debra A. Major and Ronald Burke (Eds. ), Handbook of Work-Life Integration of Professionals: Challenges and Opportunities. Northampton, MA: Edward Elgar Publishing. Gerstel, Naomi, and Natalia Sarkisian. 2008. "The Color of Family Ties: Race, Class, Gender, and Extended Family Involvement." Pp. 447-453 in Stephanie Coontz, Maya Parson, and Gabrielle Rayley (Eds. ), American Families: A Multicultural Reader. 2nd edition. New York: Routledge. Sarkisian, Natalia. 2008. "Neural Networks as an Emergent Method in Quantitative Research: An Example of Self-Organizing Maps." Pp. 625-654 in Sharlene Hesse-Biber and Patricia Leavy (Eds. ), The Handbook of Emergent Methods. New York: Guilford Press. Gerstel, Naomi, and Natalia Sarkisian. 2007. "Marriage Reduces Social Ties." Briefing Paper for the Council on Contemporary Families (CCF), January 2007. Reprint: 2009. Pp. 103-05 in Barbara Risman (Ed. ), Families As They Really Are. W. W. Norton & Co.
Gerstel, Naomi, and Natalia Sarkisian. 2007. "Intergenerational Care and the Greediness of Adult Children's Marriages." Pp. 153-188 in Timothy J. Owens and J. Jill Suitor (Eds. ), Interpersonal Relations across the Life Course. Advances in Life Course Research, volume 12. Greenwich, CT: Elsevier/JAI Press. Sarkisian, Natalia, and Naomi Gerstel. 2007. "Race, Class, and Extended Family Involvement." National Council on Family Relations (NCFR) Report: Family Focus, 52, 1 (March), 14-15. Gerstel, Naomi, and Natalia Sarkisian. 2006. "A Sociological Perspective on Families and Work: The Import of Gender, Class, and Race." Pp. 237-266 in M. P. Catsouphes, E. Kossek, and S. Sweet (Eds. ), The Work and Family Handbook: Multi-disciplinary Perspectives, Methods, and Approaches. New York: Routledge. The major topics of the course include OLS regression diagnostics, binary, ordered, and multinomial logistic regression, models for the analysis of count data (e.g., Poisson and negative binomial regression), treatment of missing data, and the analysis of clustered and stratified samples. All analyses in the course are conducted using Stata, but no previous Stata experience is necessary. This course introduces students to both hierarchical linear modeling (HLM) and structural equation modeling (SEM). The analyses in the course are conducted using HLM and LISREL software. This course will focus on panel data management and analysis, with topics including change models, fixed and random effects models, GEE models, and mixed models. All analyses in the course are conducted using Stata, but no previous Stata experience is necessary. The major topics of this applied course will include two-level models for continuous, categorical, and count outcomes, three-level models, growth curve models, models for dyadic data, and cross-nested models. The analyses in this course are conducted using HLM software. This course will provide a comprehensive introduction to quantitative data management using Stata; the focus will be on working with complex datasets (both cross-sectional and longitudinal) and preparing them for analysis. This course is intended for students who need to manage data for academic or non-academic projects. This is a continuing research workshop which covers all stages of the research process, from conceptualization and theory development through data analysis and writing. The workshop is intended primarily for sociology graduate students working on dissertation proposals and dissertations. Others will be welcomed on a case-by-case basis. The group meets bi-weekly, with individual meetings with the professor as necessary. All students who are writing dissertations are strongly recommended to enroll in this workshop, at least for one semester. This course explores the relationship between family and work from a sociological perspective. The course is designed to provide the information and critical skills necessary to address the modern conundrum of work and family life. We shatter common myths about our past and our present and examine how social forces shape the paid and unpaid work that families do. We focus on contemporary families but also attempt to situate them in a broader historical context. Throughout the course, we stay tuned to the issues of race, gender, class, and sexuality. We also explore the relationship of work and family to social policies and social change, investigating ways in which policies create and address inequities and thinking critically about mechanisms for change. This course explores the family from the sociological perspective, questioning many common beliefs about our past and our present. We study the family "across the life course" and discuss dating and mating, marriages and partnerships, mothering, fathering, and childhood, "uncoupling" and "recoupling" (separation, divorce, widowhood, and remarriage), as well as extended families and family experiences of older adults. This course provides an introduction to the use of statistics for social science data analysis. Students are expected to develop an understanding of commonly used descriptive and inferential statistics and to become competent in the use of the SPSS statistical software package.